If I counted correctly NYC Food Crawl had about a good 100 folks show up in Columbus Park, Chinatown yesterday afternoon for their pork bun food crawl! It was entertaining to hear the bakeries asking each other in Chinese,"Why are there so many Caucasians today?" 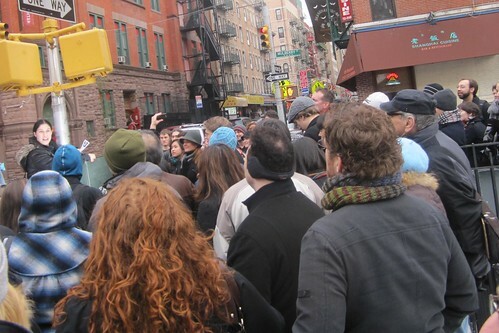 -- I wonder if they felt like they were being punked like Improv Everywhere 2004: Best Gig Ever. 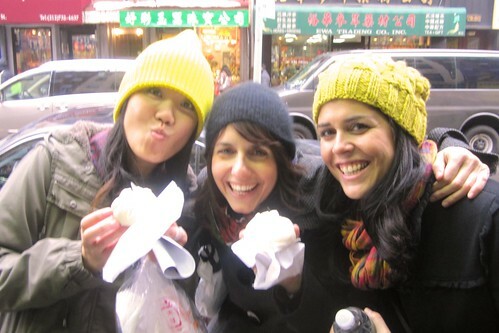 The creator of NYC Food Crawl did try to forewarn establishments that huge groups would be visiting them solely for pork buns--but obviously there was language barriers. Overall it took us 1 1/2 hours to hit all 6 places. *Lots of sweet meat, but not a fan of the bread. Their bo-lo-bao was especially dry and stale. * My second favorite. Smaller portion than Tai Pan, but quality beats quantity. *The best of the best. Everything seemed just right. New find for me, but Lisa (center) knew about this already. *Per Scott " Tastes like faux meat wrapped in Wonderbread.". Worst of the worst. You cant fake char siu! *Sells mooncakes. Didnt have any pork buns by the time we got there.